There are some people who choose to remain busy, and there are those that are able to take things as they come. Then there are those people who can do both. 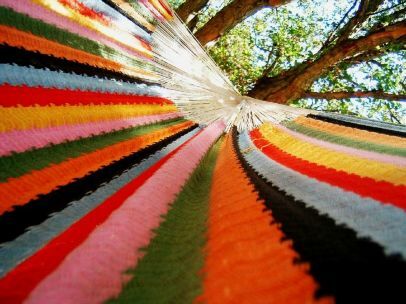 Finding a balance may start in a hammock. Figuring out how to relax while away is probably one of the biggest obstacles for most travelers (next to blowing their budget). Many feel a constant tug to see and do as much as possible, and others are content living a “normal” life. Still others are able to find a balance between the two. It’s more about the person and what he or she wishes to experience. My clients would be forced to spend all day doing nothing but lying on a hammock, taking in the breeze, eating three hearty (if monotonous) meals a day, looking out for surfacing river dolphins and making new friends without even trying. There’d be no clocks, no cellphone signals except for a few moments as you pass small cities, and certainly no computers. I’d probably upgrade the bathrooms a few steps above wretched, though, and I’d certainly charge more than $17 a day. I wonder if it was the sway of the hammock or the people and scenery — or all of the above — that made the experience more enjoyable? It could have been anything, but there is something so easy and reassuring about the hammock: It rocks you back and forth, stops you from fidgeting. It definitely made me think that inventing a portable pop-up hammock might be beneficial for everyone.